On her new blog "Presumption and Folly," military writer Jerri Bell, a U.S. Navy veteran and managing editor of the Veterans Writing Project's "O-Dark-Thirty" literary journal, has published a call for examples of women-veterans' writing from all eras, services, and nationalities for inclusion in an on-line bibliography. She has also illuminated a special writing opportunity for women veterans in next spring's "O-Dark-Thirty." Bell's blog takes its title from a quote attributed to Deborah Sampson, who enlisted in the Continental Army in 1782. 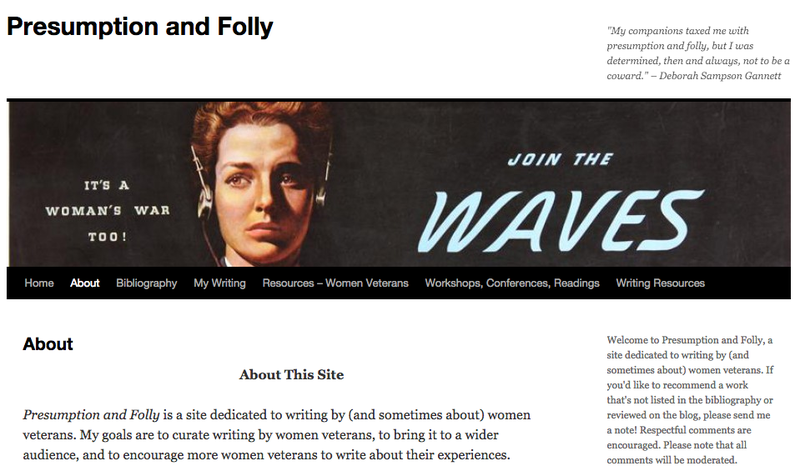 Bell's mission statement reads: "Presumption and Folly is a site dedicated to writing by (and sometimes about) women veterans. My goals are to curate writing by women veterans, to bring it to a wider audience, and to encourage more women veterans to write about their experiences." The project began in 2013, when I started developing a version of the Veterans Writing Project’s seminar exclusively for women. Our curriculum, Writing War, was full of examples of the writing craft from the work of veterans from Leo Tolstoy to Tobias Wolff; but only one woman veteran—Vera Brittain, a British nursing assistant in World War I—was represented. I decided to find more examples from writing by women veterans. It turned out to be harder than I’d anticipated. In March 2014, Cara Hoffman (author of "Be Safe I Love You" ) asserted in a New York Times op-ed that “stories about female veterans are nearly absent from our culture.” Kayla Williams, a former Army linguist and the author of two memoirs about her service in Iraq and her marriage to another former soldier with a traumatic brain injury, responded two months later in the Los Angeles Review of Books with a list of “essential contemporary war literature by women.” Both articles challenged me to go deeper – to attempt a more comprehensive survey of writing by women veterans, to think about what women veterans are and aren’t writing, and to consider how we tell our stories. The blog posts on this site represent that attempt. The editors will consider short stories (up to 5,000 words; 3,500 and under is better), creative nonfiction/essay (same word limit), poems, and short plays. Excerpts from memoirs and novels are acceptable if the excerpt stands alone as a story in its own right. Please limit submissions to one prose piece or a batch of up to three poems. Work is not required to be on a military theme! essayists, and other story-tellers engaged in exploring themes and experiences of war. April is National Poetry Month. The wars continue. Civilians, service members, and veterans continue to engage America's 21st century wars through writing, and more than a few are doing so through poetry. War poetry didn't end with the First World War. 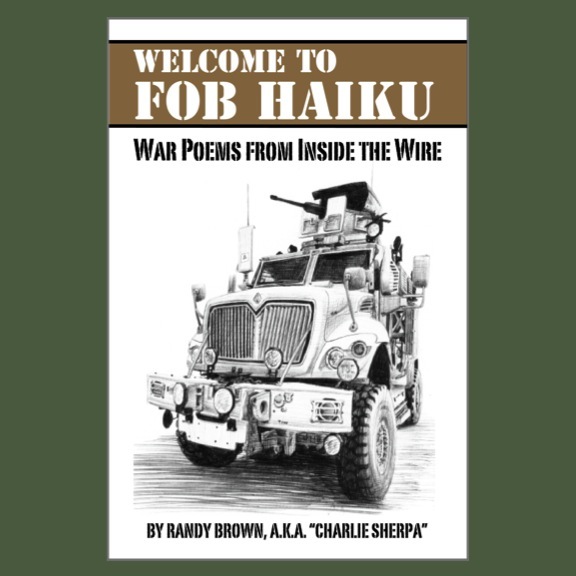 As a means of communicating and commenting on military experiences, poetry remains just as relevant and vital as other forms of literature and media. Don't believe me? I'll let an expanding and diverse chorus of modern war-poetry voices argue the point for me. 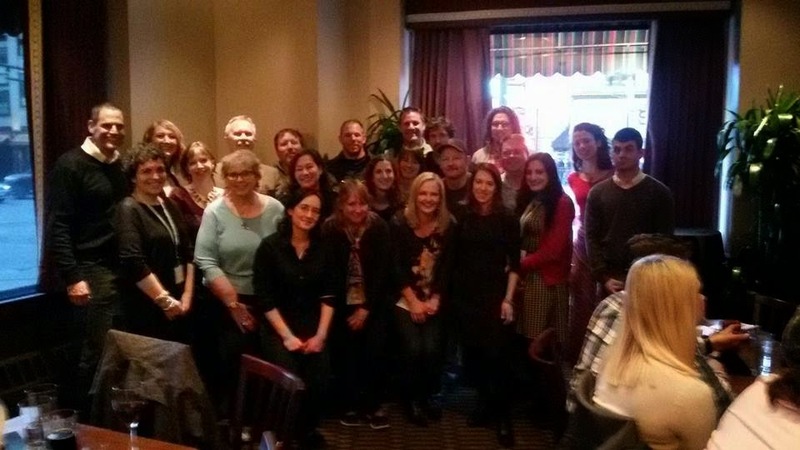 Earlier this month, I was lucky to meet up with some war-lit practitioners and camp followers at the 2015 conference of the Association of Writers and Writing Programs (A.W.P.) conference in Minneapolis. Because I'd traveled by ground, I was also able to stuff my rucksack with plenty of new books and journals. More than a week later, you might say I'm still conducting document exploitation. The AWP conference is the largest such event in North America, gathering approximately 12,000 writers, editors, teachers, and others. The 2015 event featured more than 2,500 presenters and 550 readings, panels, and lectures about craft. The concurrent book fair featured more than 700 presses, publications, and other organizations engaged in the making and distribution of literature. In 2016, the event travels to Los Angeles. In 2017, the event travels to Washington, D.C.
Rather than posting my own After-Action Report, I'll point readers toward such dispatches at Peter Molin's "Time Now" blog, as well as author Sioban Fallon's blog. Now, let's talk about poetry. I've heard it said that the people who read (and buy) poetry are most likely poets themselves. The truism is often meant as a criticism, as if poets were alone in constructing elaborate (and, no doubt, metaphorical) echo chambers in response to the worlds around them. Poetry is just like any activity, however. People who write fiction tend to buy and read fiction. People who create video games tend to buy and consume video games. People who talk on Sunday morning news shows tend to watch Sunday morning news shows. Bottom line: We're all talking to ourselves, when we talk to each other. What poetry offers over some of these other forms is that it is relatively accessible. The cost of entry is low. You can buy a collection of poetry for less than $20, or you can browse the public library shelves. Books of poetry don't take very long to read, and you can skim and flit about the pages to find poems that interest you. You can toss poems away with little guilt, or enthusiastically push them into other readers' hands and lives. Regardless of your reaction to any given work, you will at least have considered, for the briefest of moments, the world around you as seen through someone else's eyes. And that is the first step toward changing minds, and changing realities. So, in celebration of National Poetry Month, here's a start toward a "Mother of All 21st Century War Poetry Lists." These are titles that are on my bookshelf—those which deal with Iraq and Afghanistan and places in between—any and all of which I personally recommend to you. Again, it's a start. Check them out. Collect them all. Trade with your friends. Most importantly, tell me what I'm missing! "All the Heat We Could Carry" (2013) by Charlie Bondhus. Narratives of gay soldiers and their partners. "Stateside" (2010) by Jehanne Dubrow. Poems from the home front. "Bangalore" (2013) by Kerry James Evans. Red Bull Rising review here. "Clamor " (2010) by Elyse Fenton. Poems from the home front. "Here, Bullet" (2005) and "Phantom Noise" (2010) by Brian Turner. Red Bull Rising review of the poet's recent memoir here. "The Shape of Our Faces No Longer Matters" (2014) by Gerardo Mena. Red Bull Rising review here. "Red Fields" (2012) by Jason Poudrier. Red Bull Rising interview with the author here. "Letter Composed During a Lull in the Fighting: Poems" by Kevin Powers. Red Bull Rising review here. "Enduring Freedom: An Afghan Anthology" (2011; pending re-release August 2015). Poems from U.K. military service members, veterans, and family members. "Heroes: 100 Poems from the New Generation of War Poets" (2011). Poems from U.K. military service members, veterans, and family members. "Washing the Dust from Our Hearts: Poetry and Prose from the Afghan Women's Writing Project" (2015). Works in English from participants in the program's videoconference workshops. 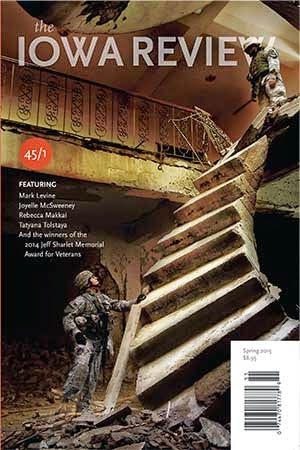 Military Experience & the Arts' "Blue Streak"
Two Sat., April 18 events in Iowa City, Iowa will help celebrate The Iowa Review's second successful Jeff Sharlet Memorial Contest for Veterans, the winning entries of which appear in the publication's Spring 2015 issue. At 7 p.m., first- and second-place winners will read from their works at Prairie Lights Bookstore, located at 15 S. Dubuque St., Iowa City, Iowa 52240. Katherine Schifani, first-place winner, will read her essay "Pistol Whip." Brian Van Reet, second-place winner, will present his short story "The Chaff." Both entries are set in the Iraq War. 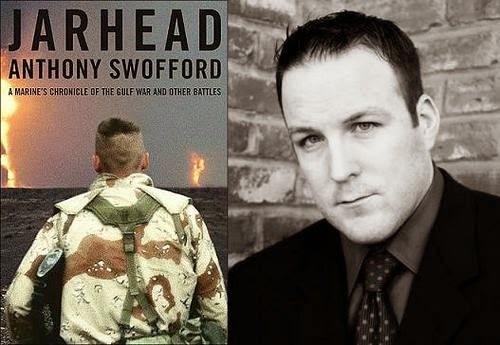 Contest judge Anthony Swofford (author of 2003's Gulf War memoir "Jarhead" ), will also read. A reception will follow in the bookstore café. For a Facebook page regarding the event, click here. The only thing I am confident [veterans] deserve, and the thing we need even more than free beer, is a voice and a space for people to listen to it. The war needs a voice because the people who fought in it need for everyone else to understand what we saw and did. A few notable writers have broken through and been recognized for describing their time in the wars, but there are thousands of veterans with unique experiences and stories to tell, all of which are necessary to really understand the war, the motivation for the soldiers fighting it, and the effect it had on us. More importantly, the more veterans who tell their stories, the more we can understand how the wars affected the rest of the country who did not go fight, how it affected people who […] only obliquely knew someone who fought them. I knew that my experience in Iraq was unique. I knew it while I was there, and I knew it when I got back home. What I didn’t know until I started writing about it was that it was also important, and not just for me. It is important that other people hear my story and know what I did and what I didn’t do because one day, our country will decide whether to fight another war, and the population must know what it is like. 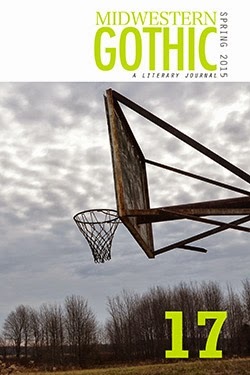 Single issues of The Iowa Review may be purchased on-line here. The next submissions period for the next Jeff Sharlet Memorial Contest for Veterans will open between May 1 and June 1, 2016. First-place winner will receive $1,000 and publication in the Spring 2017 issue; second-place winner will receive $750; three runners-up will receive $500 each. Editors report that the next iteration of the contest may be its last, given available funding. Earlier in the day at 1 p.m. Sat., April 18, Swofford will visit FilmScene to participate in a screening and Q&A discussion of "Jarhead" , the 2005 movie based on his memoir. The venue is located at: 118 E. College Street, Suite 101, Iowa City, Iowa 52240. For a Facebook page regarding the event, click here. FREE 'Unofficial Anecdotal History of Challenge Coins'! Creator of the daily web comic "Schlock Mercenary" Howard Tayler, along with editor Sandra Tayler and the rest of Tayler Corp., released this week a unique collection of stories about challenge coins. 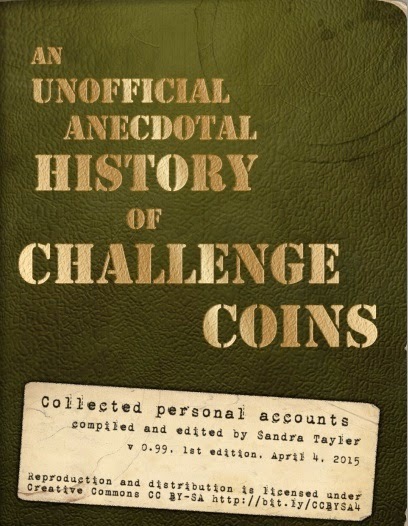 The 32-page "Unofficial Anecdotal History of Challenge Coins" (U.A.H.C.C.) is available FREE as a PDF that can be downloaded here and here. In the U.S. military and other organizations, challenge coins are used to informally commemorate relationships, missions, and good jobs done for the cause. Coins aren't as highfalutin or formal as a medal, and they're not useable as cash, but they're great souvenirs and conversation starters. In some unit cultures, they can also be used to win free drinks. [The UAHCC] is not an authoritative attempt to codify the rules of coin challenges, nor is it a scholarly treatise creating an historical narrative. It is a collection of stories that are similar to the sorts of stories you might hear if a bunch of people were sitting around at the bar one night draining pints and talking about challenge coins. We've done our best to present these stories in a way that respects the various challenge coin traditions, and pays appropriate tribute to those who have served. Some personnel prize their coins more highly than other military mementos. Because each one comes with a story. For example, military-fantasy writer Myke Cole writes in a few closing words to the UAHCC: "[T]here are times I don’t feel capable of doing good, don’t feel equal to the work necessary to pull good off. The coin sits on my rack, a glittering reminder of the good I can do when I really try." 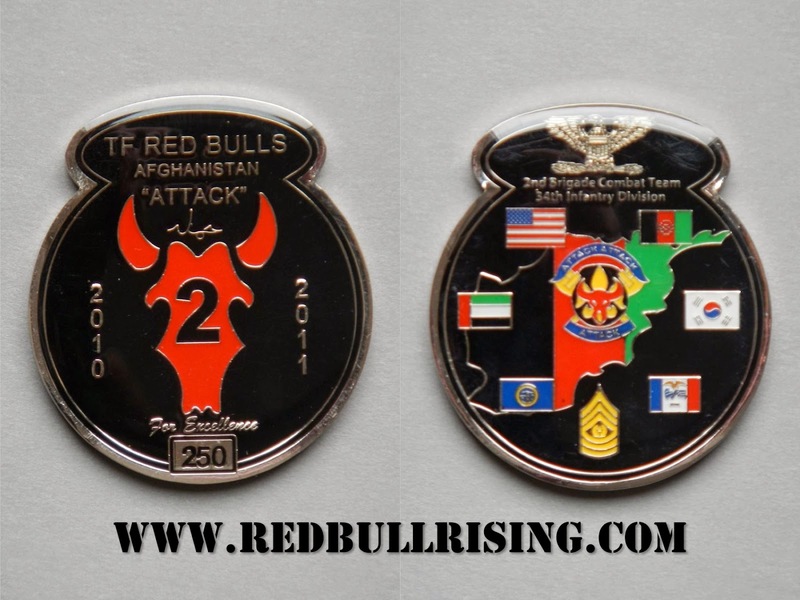 The project even mentions 34th Infantry "Red Bull" Division deployment history! 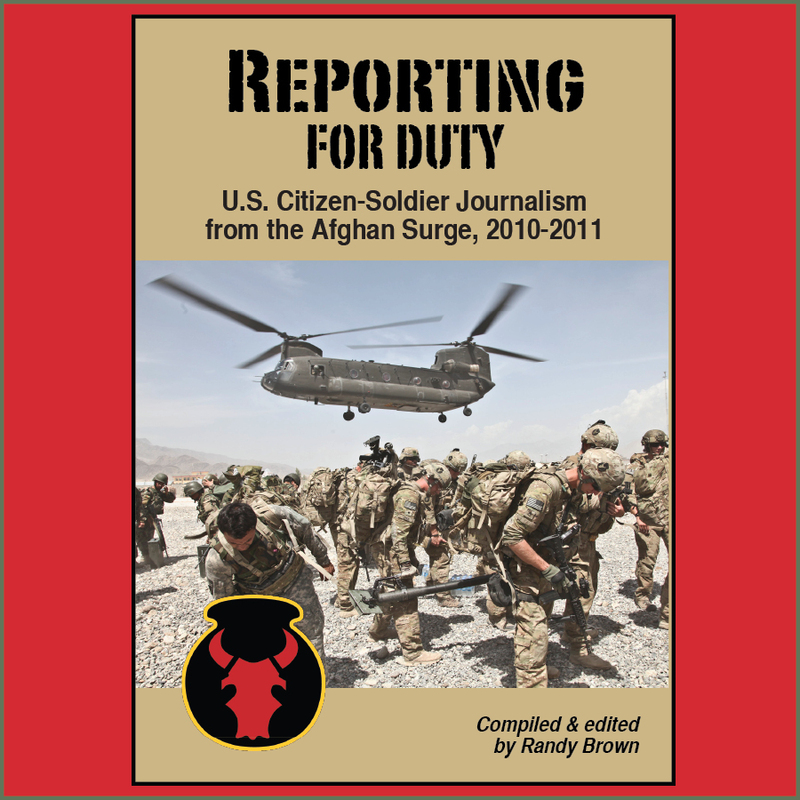 On page 24, the writer of the Red Bull Rising blog tells the story of arriving in Afghanistan in 2010-2011 as civilian media, and how the presentation of a unit coin played out in a humorous mix of tribal welcome, homecoming, and unexpected hugs. Someone also called him a puppy. Howard Tayler writes the introduction to the UAHCC, and punches up the action with a few cartoon illustrations. All are right on target. While Tayler is not a veteran himself, his storytelling always manages to capture the cozy, good-natured camaraderie of serving with others in uniform, while chaos and armageddon are danger-close. The antics and sayings of his misfit band of space mercenaries are much celebrated in some military circles. His ongoing list of "70 Maxims of Maximally Effective Mercenaries" begins with rule No. 1: "Pillage, then burn." No. 2 is "A Sergeant in motion outranks a Lieutenant who doesn't know what's going on." No. 3 is "An ordnance technician at a dead run outranks everybody." Maxim 2/3 coin available at www.schlockmercenary.com. The UAHCC was initiated as a stretch goal in Tayler's successful challenge coin Kickstarter campaign in 2013, which raised $154,294 on an original goal of $1,800. 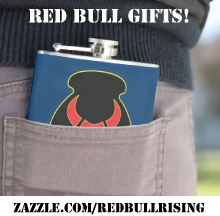 (See a Red Bull Rising mention of that project here.) 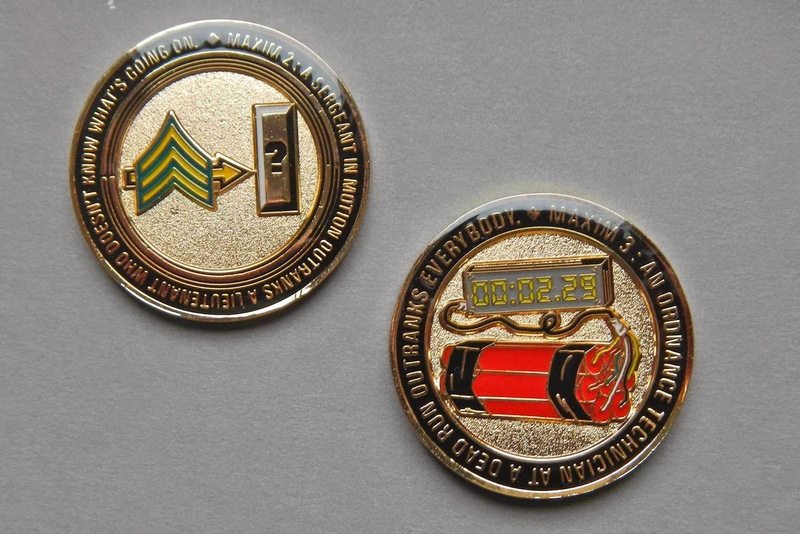 Many of Tayler's words have since been captured on challenge coins, and the UAHCC project seems a particularly appropriate bit of thanks and payback to his military fans. For more information on the UAHCC, or to contribute to later updates, the Schlock Mercenary website advises: "Please direct all inquiries to schlockmercenary [AT] gmail.com, and include the unpronounceable acronym 'UAHCC' in the subject line. We welcome submissions, hosting updates, suggested changes, and requests for source." Howard Tayler, creator of "Schlock Mercenary," sent these greetings from GenCon 2011. April, in addition to being both cruel and full of showers, is National Poetry Month. When I started the Red Bull Rising blog in late 2009, a more-established mil-blogger contacted me, gave me some blogging tips, and also shared that she was also a journalist by day, and also a poet. Then serving as a citizen-soldier, I'm not sure which part of that mix sounded more alien to me at the time. Blogger? Journalist? Poet? Now, however, I find myself routinely pointing people toward opportunities to document, explore, illuminate their military experiences through expressive arts. And that includes poetry, as well as fiction and non-fiction writing. I'm also a fan of visual, theatrical, and performing arts, although I'm not usually a direct participant. 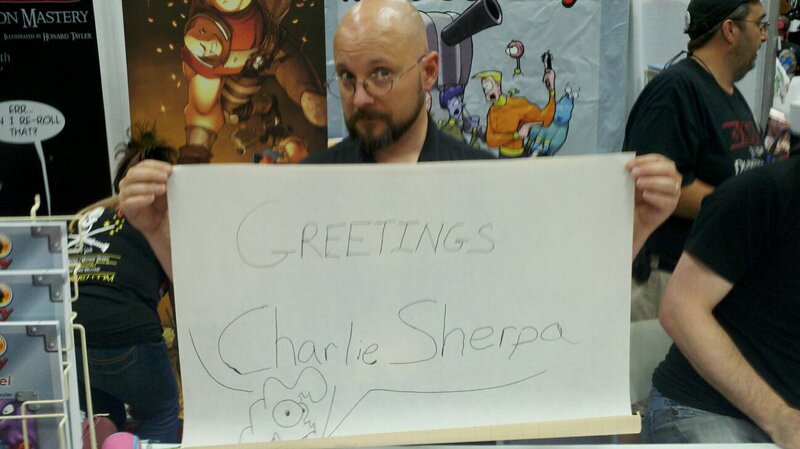 Evoking Sherpatude No. 26 ("Humor is a combat multiplier …"), most of my poetry goes for the joke, rather than the jugular. I write goofy haiku. I write light verse about the light infantry. On a good day, I might call myself a "soldier-poet." Or a "mil-poet." And, for me, April 2015 is full of good days. In November 2011, during a "Writing My Way Back Home" veterans writing workshop in Iowa City, Iowa, facilitator Emma Rainey offered a prompt following a session that featured readings of poems written from conflicts ranging from World War II to the Iraq War. While I've forgotten what the prompt was exactly, I haven't forgotten that a poem sprang to my notebook nearly fully formed. It had been generated by a fragment of memory, a half-anecdote of something that had happened upon my arrival as a civilian reporter to Afghanistan. My travel was there was relatively fresh—I'd embedded with my former military unit in May-June 2011. I hadn't yet figured out what this particular story meant, and it wasn't big enough for a even a blog-post. It generated a poem, however. And no one was more surprised about that than I. More on that poem in a minute. As I've mentioned elsewhere, 2014 was an extremely productive year for me, in terms of writing and publishing. It just wasn't in ways that I'd have been able to predict back in 2009. Editors at a number of literary journals and publications chose to publish my work. I am humbled and grateful and thrilled. Recently, for example, the Veterans Writing Project's literary journal "O-Dark-Thirty" published a poem that I'd originally written for a love-themed book store poetry contest in 2014. Earlier, I'd become infatuated with a library find: "77 Love Sonnets" penned by Garrison Keillor. So, when Keillor's own Common Good Books, St. Paul, Minn., announced a 2014 contest for love poems—to be directed at nearly any person, place, or thing—I was inspired to write about the time Uncle Sam took away troops' World War II-era M1 helmets ("steel pots"), and gave us the heavy, Kevlar helmets that were part of the "Personnel Armor System for Ground Troops" (PSAGT, pronounced "paz-get"). The new "K-pot" headgear had some decided advantages. For example, they could actually stop a bullet. But they lacked some of the utilities of their predecessors—like being to cook, bathe, and carry spent brass in them. They also gave me headaches. once clipped a crown of thorns, my skull is snared. you have one purpose: Save my pounding head. You can now read the whole work in its entirety (although some language may not be suitable for work) here. Enjoy! April 2015 will also see the publication of my military-themed poetry in Midwestern Gothic No. 17. (Available in print or Amazon Kindle here.) The work fuses experiences of growing up listening to farm reports on the early morning radio; catching up on community happenings at a small town diner; and reading perennial news items about the start of "fighting seasons" downrange in Afghanistan. In war, baseball, and farming, hope springs eternal. The anthology was a bonus project from Tayler's 2013 use of Kickstarter to crowd-fund "Schlock" challenge coins. He's about to launch another Kickstarter project—this one for a role playing game—but his personal code of ethics won't let him move on until all aspects of his earlier project are final. Rather than submit a challenge coin anecdote, I sent a poem. As always, I'll keep you posted as to when it hits the Internet. And yet more of my work is forthcoming this summer and fall: the Water Wood Press war poetry anthology "No, Achilles"; the Corn Belt Almanac from The Head & The Hands Press; and the U.S. Air Force Academy's literary journal "War, Literature and the Arts," to name just a few! Will all this poetry and nonsense change the war or change the world? Probably not. But it's fun, and I'm learning new things. And maybe, I'll be able to teach a thing or two as well. Happy National Poetry Month! The Red Bull says: "Attack! Attack! Attack!"